Shakespeare's Othello is a complex play, and one of the most interesting topics within it is the idea of interracial marriage. With a black Othello and a white Desdemona being at the center of an immense tragedy, audiences for centuries have wondered about the implications of their relationship. An interracial marriage in the sixteenth century? It seems impossible. After all, it's easy to assume that Elizabethan people were completely backwards in their thinking. And we know that in the last few centuries, interracial couples have faced extreme prejudice, racism, and hatred just for living their lives. So it comes as a surprise to most people to learn that interracial marriages weren't unheard of in Elizabethan times. 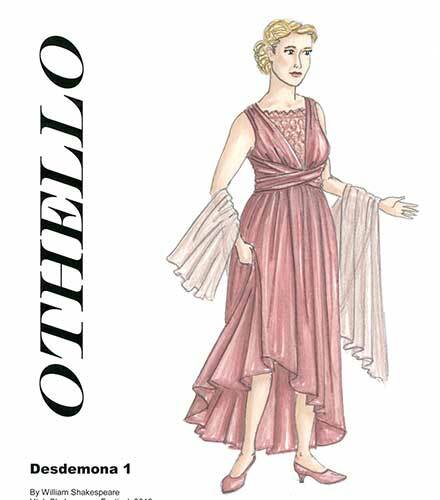 Though they weren't as common as they are today, Shakespeare's audiences probably wouldn't be too shocked or surprised by Othello and Desdemona. The lovers in Othello aren't the only interracial couple in Shakespeare. Antony and Cleopatra come to mind, as well as Aaron and Tamora in Titus Andronicus. There are even several others this season: The Merchant of Venice's Lancelet Gobbo has a "Moor" mistress, and Jessica, ethnically Jewish, marries Lorenzo, a Christian; and then there's the fact that one of Portia's suitors is a prince of Morocco. And it doesn’t stop at fictional characters. Shakespeare may have been in an interracial relationship of his own; though we don't know for certain, many scholars believe that the Dark Lady, the subject of a number of beautiful sonnets, was African or Arabic in descent. Is it any wonder that Shakespeare wrote so many interracial couples into his works? In Elizabethan England, interracial marriages were not uncommon. This might have been because people of color in the Early Modern period were better off than you might assume. This isn't to say that they didn't face racism, but we know that black Elizabethans sometimes had decent positions in society, they held property, and they faced fairly equal protection under courts of law (Miranda Kaufman, "Making the Beast with two Backs—Interracial Relationships in Early Modern England," Literature Compass 12/1 [2015:25]). Far from being "strange," "exotic," or "rare," there were plenty of people of color in Elizabethan society. Chances are that Shakespeare would have run into them in his everyday life. People of color were commonplace in his day, and as could be expected, they sometimes married white men and women. Charles Gildon, a writer from the mid 1600s, claimed that "Experience tells us there's nothing more common than matches of this kind, where the whites and the blacks cohabit" (as quoted in Kaufman 2015, 24). This was even more common in Venice, the setting of Othello: according to Dennis Britton, the city "is reported as being a space of inclusion (though surely of a commercial and imperial nature)" (Dennis Britton, "Transformative and Restorative Romance: Re-"turning" Othello and Locating Christian Identity," in Becoming Christian: Race, Reformation, and Early Modern English Romance [Fordham University Press, 2014]). It makes sense, then, that Shakespeare would set Othello in Venice— a city known for its “melting pot” nature. The fact that interracial marriages took place, however, didn't mean that everyone was comfortable with it. We can see this from the very beginning of Othello: after learning that his daughter has eloped with the Moor, Brabantio becomes enraged and sickened, even accusing Othello of sorcery in seducing his daughter: "Damn’d as thou art, thou hast enchanted her; . . . [if she] would ever have, t'incur a general mock, Run from her guardage to the sooty bosom of such a thing as thou—to fear, not to delight" (Othello 1.2.82–90). Even so, we know that legally, interracial marriages were allowed. After all, the senate does not convict Othello of any wrongdoing when it hears his story. In real life, too, these marriages weren’t prosecuted by the law. Interestingly enough, in cases where a black man and a white woman were caught in a relationship outside of marriage, the punishments were exactly the same as if it were a white man and white woman. It's clear that the law usually treated interracial relationships as valid as relationships between white men and women. Though there were undoubtedly racist and hateful attitudes in Shakespeare's day, the fact remains that interracial couples lived their lives in relative anonymity, unbothered by extreme discrimination and prejudice. For the most part, Elizabethan subjects were accustomed to people of color and their relationships with whites. It's no wonder, then, that Iago fails to hurt Othello on the basis of his race-—after all, the audience sees that it’s Othello’s heart that makes him who he is, not his skin.